How can I obtain the series of exercises for Graham floor work? Even just the names? Remember that the exercises themselves do not have names, but there is a basic vocabulary (notions for movement) attributed to Graham, which is used in the arrangement of the floor structure of a class. The exercises are adapted by each teacher, according to the level and needs of the students. However, the notions that are most commonly practiced in Graham's floor work are the bounces, breathings, turns around the back and spirals. A typical Graham class begins on the floor with a series of bounces forward in the Graham’s first sitting position. Seated contractions and spirals concentrating on breathing follow. Floor work continues in a seated fourth position with the back leg's inner thigh on the floor, the front knee bent at 90 degrees and slightly elevated, and the ball of the front foot touching the floor. Other exercises in the second, third and fifth sitting positions follow until evolving to stand up. Helpern, Alice. "The Technique of Martha Graham." Dobbs Ferry, N.Y.: Morgan & Morgan, 1994. 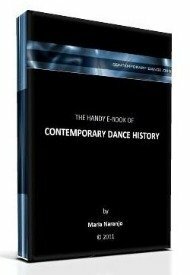 Originally published in Studies In Dance History 2, no. 2 (Spring/Summer 1991). Horosko, Marian. "Martha Graham: The Evolution of Her Dance Theory and Training." Gainesville, FL: University Press of Florida, 1991. I'll be waiting for your visit to participate at contemporary-dance.org in any other way!